I love lettuces. Can never get enough of them. This year I was determined to get sowing nice and early and be eating my home-grown leaves by the end of May. Well, I found a mildish day at the beginning of March and optimistically sowed a number of small trays of lettuces. I popped them into my mini outdoor greenhouse (with no heat) and started to get excited. Six weeks on, and a lot later than I had planned, I’m pricking out these ‘All the year around’ lettuce seedlings above into modules. They’re rather on the leggy side due to the low light conditions and low temperatures that we’ve had in March. Out of everything I grew last year, I think lettuces gave me the best return for the space and time they occupied. I loved experimenting with ‘no dig’ potatoes and rainbow carrots in pots-they were a true delight to unearth-but it was the lettuces that kept me in dinners all summer long, from June until August. I’m so looking forward to planting these seedlings out to create decorative displays (as well as supplying many meals) and I still have it firmly in my head to try and master successive planting of these leaves (sowing again in July and August), so that I can have salads all year round from my own garden. p.s. I’ve also sown ‘Green in Snow’, ‘Red Knight Mizuna’ and ‘Broad leaved Mizuna’ to add a mustardy bite and extra texture to my salads. Yep, I’ve done the ‘twirling into the soil’ trick with my seedlings too. A useful tip gleaned from Alys Fowler via #saladchat last year and I’m happy to report it’s worked just fine with my 22. Think I picked up this twirling tip when I was on the RHS general certificate course from our lovely teacher Joe, who was head of horticulture at St. James Park. Loved that course! 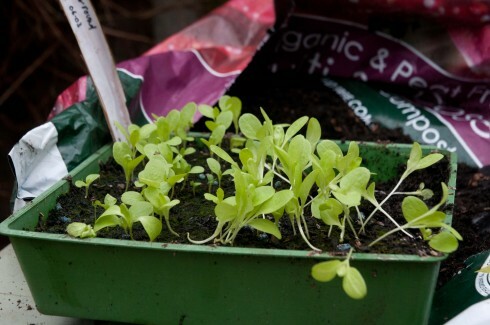 Have also ordered a few more different packs of lettuces from Nicky’s seeds which I’ll sow as soon as they arrive. Feeling bloomin’ nippy again today though…. Impressive effort, I didn’t realise you could twirl the leggy stems in the compost like that – always so scared of rots. Have you tried Crisp Mint? Fell in lust with it a couple of years ago… lovely little cos one. Hi Alex, haven’t tried Crisp Mint, but will keep a look out for it. This year I’m growing a mixture of Cos, Oak leaf and Butterhead varieties-does it grow well into autumn? Hi Linda, Hoping to get direct sowing soon too as I’m running out of mini greenhouse space, but it still feels a tad on the nippy side. I like to grow some lettuces in modules though as you can then pop them into spaces when they become available and the larger plants also seem to survive slugs and snails better…..I hope. Off to investigate copper sheeting later today for more protection. What a great selection of lettuce you’re growing, mine are a bit behind yours, plus have some hardy salad leaves in the garden. Love the tip for planting out leggy lettuce, definitely going to use that. Hi Andrea, will be growing some fruit at my petite allotment, but love growing these lettuces right outside my front door. Trying to be as decorative as possible too this year. I have some lettuce seedlings on the balcony in wine boxes! They’ve just started to come up. Not sure when I should thin them out though? We’ve got radish seedlings too, love a good radish. Hi Kathryn, glad to hear things are growing well on your lovely protected balcony. If the seedlings are looking too bunched up and close together, then start thinning out. Be careful not to disturb the roots of the seedlings you leave in the soil though-you could just even snip spare seedlings with a small pair of scissors so that you don’t disturb the roots. I tend to thin out in a few goes, so as the seedlings get bigger (and you need to space out the lettuces further apart), I can use them as micro leaves in salads. Yes a green salad either for lunch or dinner most days is one of the many joys of homegrown especially with a walnut oil and garlic dressing. I am so impressed with your lettuce selection I am going straight to my seed box to see what I can find. I am rather embarrassed to have blogged about planting out.a tray of living salad purchased at the supermarket. I was in a hurry to see stuff growing is my only excuse. 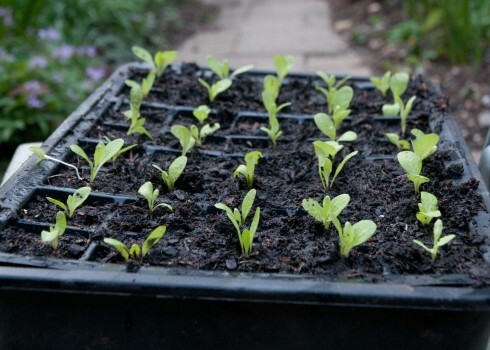 Hi Sue, Colin below uses this idea too and I think it’s a great (and inexpensive) solution when your seedlings are nowhere near ready to plant out.Tried this last summer and I got about 6-8 clumps growing from a tray of living lettuces-lots of nice dinners! Great twirly tip for spindly lettuces, will try that instead of re-sowing my leggy specimens here! Love Sea Spring too, they were at the London RHS show and really like the come and cut again advice. Also just read your no dig potato blog post and inspired to try that too. Thanks. Hi Jules, yes always pop by their stand when I go the the RHS London Shows. Joy Michaud always gives loads of great advice on their stand. We’ve also ordered some Chilli plug plants for our community veg growing project from Sea Spring Seeds and hopefully these should be arriving any day now. love your lettuces! I don;t really have the room the get the seeds going, and sometimes buy living lettuce from the supermarket, divide it up, and plant them out in the gorund or in containers. Workls really well, and they look really good, though not as tasty as the ones you grow! Hi Colin, Sue (above) uses this great idea too. Great way to fill in gaps in your lettuce growing, although you’re right, you don’t get to choose the varieties you grow! My salad leaves look similarly spindly so you’ve reassured me that’s normal given the weather. Not sure I have time to twiddle all those individual leaves into the ground but I realise you’re suggesting that for lettuces rather than leaves…it could be quite therapeutic though! Met a gardener recently who knows your street and was saying how great it looks. Hi Claire. Our street looking quite lovely at the moment as the are Daffodils of all shapes and sizes in loads of front gardens. Just about to scatter some wildflower seeds in our tree pits too! Hi Anna, Had a complete seed sowing lull after sowing these seeds as the weather was just so miserable. Still to sow half of my sweet peas-and just sowed some Tromboncino courgettes and cucumbers yesterday. Abanadoned tomato seed sowing for easy to find varieties, and have bought small Sungold plants from a garden centre…. Exbury lettuce looks lovely-do your red veg survive better from slug and snail attacks? I quite agree Bridget. My outdoor lettuces didn’t make it much past December, but I’m still eating ‘Giant red mustard leaf’ and ‘Red Knight Mizuna’ that I planted late last summer. I have some really healthy looking seedlings from a leaf mix and I am going to separate them and put them into beds this weekend. Apart from that I am growing rocket, mizuna, mustard and radicchio. Can’t wait to eat them. Hi Sneaky Magpie, Definitely know that can’t wait to eat them feeling! I agree, lettuces are fantastic things to grow. We really enjoyed Cos Freckles last year, once I had reassured everyone that they were supposed to have spots! I always have some red and green oak leaves and some giant red mustards as well, they are really mustardy – not for the faint-hearted. I’m loving French Sorrel at the moment too, it has a beautiful sharp flavour. In fact I have a drawer full of salad leaf seeds, they somehow seem to gravitate to me. You have reminded me to get sowing and planting out. Hi CJ, been nibbling at my Sorrel too. What a fantastic leaf! And perennial to boot. My Sweet Cicely is just starting to emerge too and just a hint of this alongside other leaves really enlivens a salad at this time of the year. Must remember to keep on successionally sowing! Hi Tanya, Reine de Glaces looks gorgeous and spikey. Will add to my list! Little and often-definitely the way to do it, although I do get a bit excited at the beginning of the growing season….Did eat a mini few trays of spare seedlings (which I couldn’t find a space for) as micro leaves the other day-quite delicious.